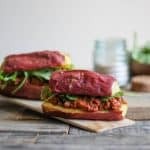 These homemade, tomato-free Sloppy Joes are a simple, quick, and healthy recipe you can prepare for the whole family. 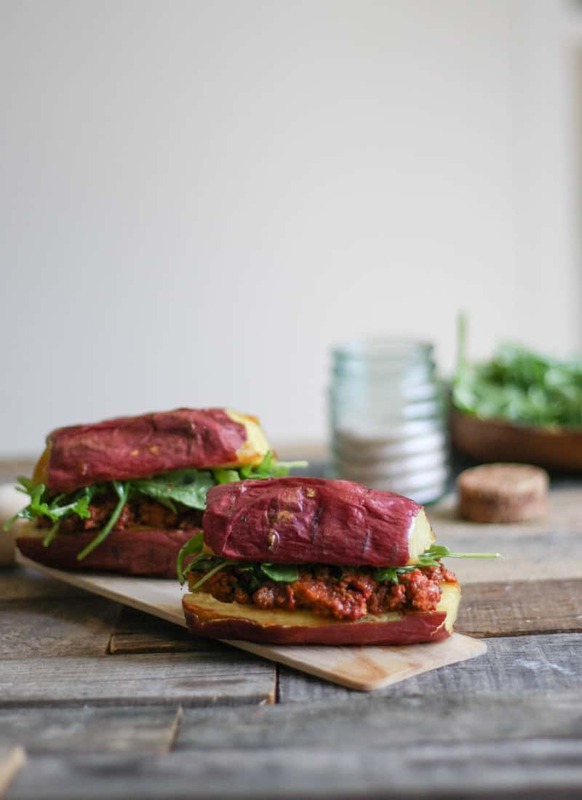 Since this recipe for Sloppy Joes and Sweet Potato Buns is full of hidden veggies and flavor, it’s one you’ll love including in your weekly meal plan. AIP, Paleo, and Whole 30 friendly! Even though I didn’t enjoy eating much meat when I was younger, Sloppy Joes was one recipe I’d sit down to with enthusiasm. Back then my mom would make our Sloppy Joes with toasted whole wheat buns, and top them with cheddar cheese and sliced Clausen pickles. My mouth is watering just thinking about the combo! 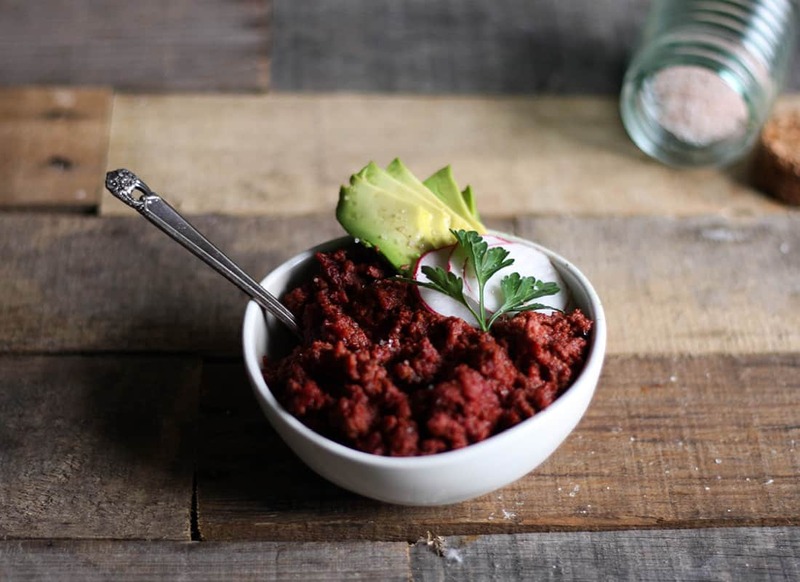 These days I eat animal protein on the daily, but until I created this recipe, Sloppy Joes were a thing of the past. Not only do traditional Sloppy Joes prominently feature nightshade veggies like tomatoes and bell peppers, but the canned Sloppy Joe mix, aka ‘Manwich’, also contains 3 types of sugar – high fructose corn syrup, regular corn syrup & sugar – along with guar gum, xanthan gum, ‘natural’ flavors, and citric acid. Even if I could tolerate nightshade veggies, no way in heck is that Manwich concoction going anywhere near my body. My recipe on the other hand, is completely free of soy, corn, gluten, processed sugars, and nightshade veggies and spices. As a bonus, it’s full of antioxidant rich veggies from the inclusion of my simple Nomato Sauce recipe. And just like any good nostalgia food, you won’t miss a thing from about childhood favorite. We’ve been making this recipe on a weekly basis in the Garland casa – we can’t get enough! We’ve eaten it so many different ways: from a bowl topped with avocado and cilantro, on Sweet Potato Buns with zucchini cheese and arugula, even on cassava flour tortillas with over-easy eggs. However you choose to indulge your childhood cravings for Sloppy Joes, you can’t go wrong. Saute onions in coconut oil and sea salt over medium-low heat. Add beef to skillet with onions and cook through. Add Nomato Sauce (here’s the recipe I use), maple syrup, and coconut aminos. 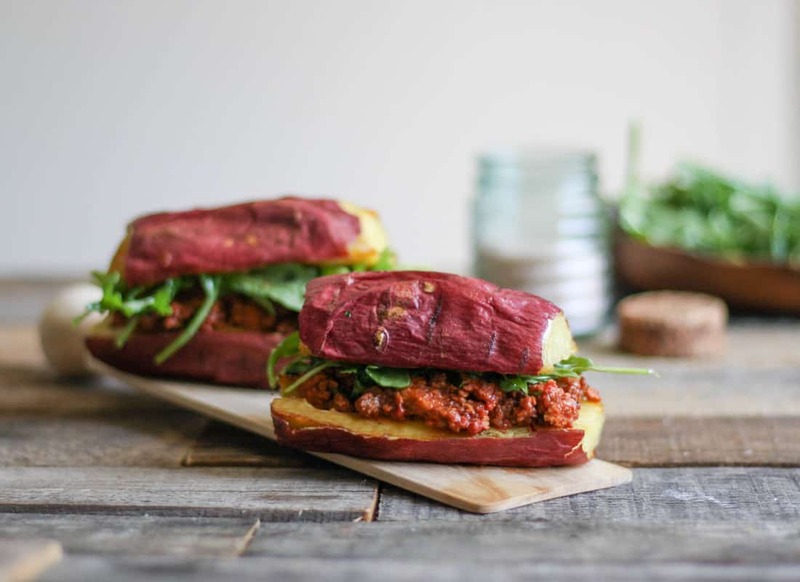 Enjoy in a bowl with avocado and cilantro, or on a Sweet Potato Bun (recipe below) with arugula and zucchini cheese on top. How fun! My birthday is on Tuesday next week, when is yours? Happy early birthday! Yes, if you have a large enough pan to cover your potatoes with water, it’ll work just the same! You could also use a crockpot if you have one, but I have no idea how long it’d take. I’d guess you’d want to periodically check on them with a fork to see when they were mostly cooked through, but not too soft.